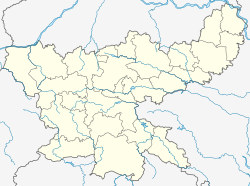 Udhwa is a community development block that forms an administrative division in Rajmahal subdivision of Sahibganj district, Jharkhand state, India. It is located 42 km from Sahibganj, the district headquarters. Udhwa, the eponymous CD Block headquarters, is located at 24°58′13″N 87°50′43″E﻿ / ﻿24.97028°N 87.84528°E﻿ / 24.97028; 87.84528. It is on Mokama-Farakka Highway – NH 80. The district can be divided into two regions, one of which is the plains, consisting of uplands, undulation along ridges and depressions covers the Sahibganj, Rajmahal, Udhwa and Barharwa CD Blocks. Three rivers flowing through this region – the Ganges, Gumani and Bansloi - make the plains rich and cultivable. The inhabitants of this region are mostly non-tribals of various castes and Paharias and Santals. Udhwa CD Block has 129 gram panchayats, 79 inhabited (chiragi) and 50 uninhabited (bechiragi) villages. As per 2011 Census of India Udhwa CD Block had a total population of 177,263, of which 167,727 were rural and 9,536 were urban. There were 90,967 (51%) males and 86,296 (49%) females. Population below 6 years was 38,505. Scheduled Castes numbered 6,269 and Scheduled Tribes numbered 9,741. In 2011 census Patra was a census town in Udhwa CD Block with a population of 9,536. Udhwa CD Block had several villages with a high population (2011 census population figures in brackets): Begamganj (11,316), Radhanagar (6,330), Udhua Diara (11,531), Palasgachhi Diara (18,328), Piarpur Diara (13,340), Amanat Diara (7,487), Pranpur (8,300) and Srighar (5,712) . As per 2011 census the total number of literates in Udhwa CD Block was 65,797 (47.71% of the population over 6 years) out of which 38,343 (58%) were males and 27,454 (42%) were females. As per 2011 census, literacy in Sahibganj district was 52.04. Literacy in Jharkhand (for population over 7 years) was 66.41% in 2011. Literacy in India in 2011 was 74.04%. ^ "Udhwa Police Station by Hafizur Rahman". Jharkhand. Wikimapia. Retrieved 12 January 2016. ^ a b "District Profile – Physical Aspects". Jharkhand. Sahibganj district administration. Archived from the original on 4 March 2016. Retrieved 12 January 2016. ^ a b c d "2011 Census C.D. Block Wise Primary Census Abstract Data(PCA)". Jharkhand – District-wise CD Blocks. Registrar General and Census Commissioner, India. Retrieved 12 January 2016. ^ "District Census 2011". Population Census 2011. Retrieved 12 January 2016. ^ "Jharkhand Profile" (PDF). Census Info India 2011 – Final population totals. Census Commissioner, Government of India. Retrieved 12 January 2016. ^ "Literacy in India". Census 2011. Census population 2015 data. Retrieved 12 January 2016. This page was last edited on 14 July 2018, at 12:25 (UTC).